Another election defeat, another call for his head. 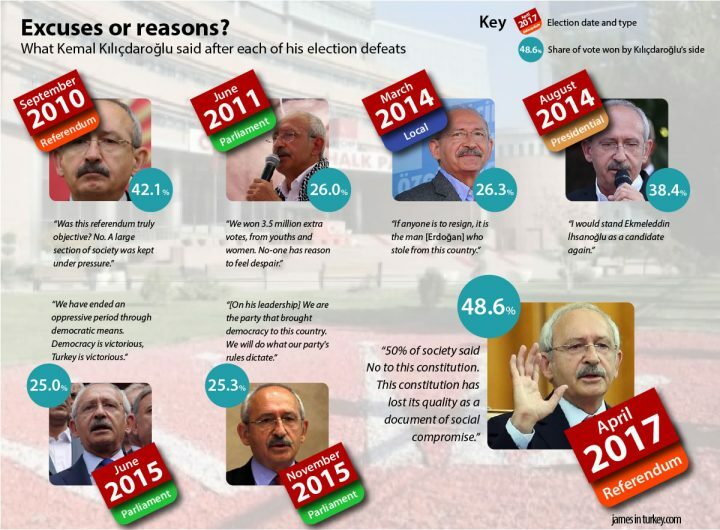 So goes the tired story of Turkey’s opposition CHP and its leader since 2010. Last month’s executive presidency referendum marked the seventh time that Kemal Kılıçdaroğlu’s side failed to win an election in the country. Not for the first time, his detractors argue he should take responsibility and resign. Not for the first time, he says he’s going nowhere. Through a westernised electoral lens, Mr Kılıçdaroğlu’s intransigence is bewildering. He has failed to deliver victory in every type of election possible – three parliamentary elections, two referendums, one local and one presidential election. It’s a startling record. What’s more, he’s personally unpopular among voters and polls poorly compared to other party leaders. For many, it’s the fact he isn’t a charismatic crowd-pleaser to rival President Erdoğan that condemns him to perpetual cycles of defeat. It’s a sentiment shared by a fair few CHP MPs. The first was Fikri Sağlar, who gave an interview to Akşam, a pro-government newspaper, in which he accused Mr Kılıçdaroğlu of becoming the “one-man ruler” he criticised President Erdoğan of being. Next, a group of 14 CHP MPs led by Muharrem İnce, an MP from the Marmara town of Yalova, challenged Mr Kılıçdaroğlu to call an extraordinary congress to discuss his leadership. Then on Saturday, one of Mr Kılıçdaroğlu’s senior team resigned. Selin Sayek Böke, who spoke for the party on economic matters, said she did not “find it appropriate to be part of the existing leadership style at this stage”. “The steps that should have been taken since the night of 16 April have not been taken with the necessary political determination,” she added. Topping all the rebels was former CHP leader Deniz Baykal, who said Mr Kılıçdaroğlu should either announce his plans to stand against Recep Tayyip Erdoğan at the next presidential election or stand down at once. Mr Kılıçdaroğlu has been ruthless in his treatment of the dissidents. Mr Sağlar, who claims Akşam distorted what he said, has been referred to the party’s disciplinary board and faces expulsion. Any other rebels will be “shown the door”, he has said. He also accused the government of stirring up unrest in his party after the referendum, echoing conspiracies normally heard in the corridors of the AK Party. But this behaviour is uncharacteristic in its ferocity: in his seven years as leader Kemal Kılıçdaroğlu has transformed the CHP into the most transparent party in the country, one that developed reasoned policies and ran primaries to elect many of its parliamentary candidates. It’s a remarkable change from the days when Mr Baykal was at the helm, spouting tired mantras to anyone who would listen. The trouble is that while Mr Kılıçdaroğlu has successfully reformed his party and broadened its appeal, he hasn’t broadened it enough. His side has never won an election and each defeat has been marked by a refusal to take responsibility. The first couple of defeats, in fairness, came within a year of him becoming leader. And he could point to near-wins like the 2014 mayoral election in Ankara, which was mired by accusations of fraud. But it was Mr Kılıçdaroğlu who signed off on the surprise decision to nominate Ekmeleddin İhsanoğlu, the pious academic, for the presidency against Recep Tayyip Erdoğan. The decision attracted widespread grassroots anger and did not prevent Mr Erdoğan’s victory in the first round. And despite attempts to steer the CHP to the right and attract conservative AK Party voters, the two general elections in 2015 delivered one quarter of the electorate – just like it did in 2011. The case for Mr Kılıçdaroğlu to step down and let a fresher, younger face have a go is growing stronger. That’s certainly the view of Muharrem İnce, the Yalova MP who challenged for the leadership after the Ekmeleddin İhsanoğlu candidacy in 2014. That time, a confident Mr Kılıçdaroğlu agreed to call an extraordinary congress against his leadership and defeated Mr İnce. On Monday night, Mr İnce said he would be gathering signatures to mount a fresh challenge. It’s no easy task. Mr İnce needs signatures from 10 percent of delegates during a party congress in order to stand. But he needs to force a congress to gather first and the threshold for doing that is higher: one-fifth of around 1200 delegates. Of course, Mr Kılıçdaroğlu has the power to call a contest himself, like he did last time. But as yet there are no signs of that happening.